At this week’s FILMART 2019, the Hong Kong film and television expo, TVB introduced its 10 most significant and exciting dramas of 2019. One of the dramas showcased was The Defeated <鐵探>, which stars Kara Hui (惠英紅), Phillip Keung (姜皓文), and Benjamin Yuen (袁偉豪). The cast attended to support the drama, and afterward Benjamin uploaded photos of the shocking weight loss he underwent to portray his character of a terminally-ill patient. In The Defeated, Benjamin’s character suffered a gunshot wound in his head. This caused aftereffects of incontinence, nasal discharges, and brain damage. To portray the role of an extremely miserable patient, the 37-year-old endured an extreme diet for three months and lost 20 pounds. He couldn’t exercise and had to follow an extreme diet of a corn, boiled egg, tomato, and coffee. The actor also noted that it was his first time since 18 years old to weigh 140 pounds. Looking extremely thin where one could even see his bones, many had thought Benjamin suffered a serious illness. The actor hopes to get back to exercising and recover his fittest condition from four years ago during A Fist Within Four Walls <城寨英雄>. Not worth it. And he’s not really a spring chicken anymore, he shouldnt risk messing up his body. not sure if it’s worth the effort to go through this for tvb. 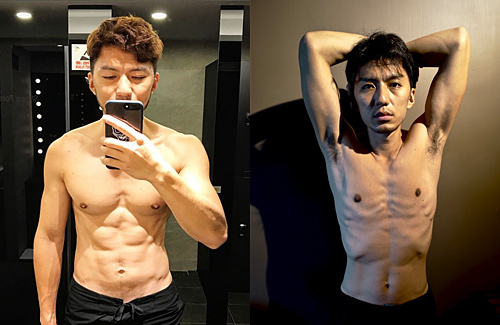 if it was for a movie role, i’d say yeah but knowing that tvb doesn’t appreciate their employees and take everything for granted, why would he want to do this to himself? @m0m0 Exactly my thoughts. For example Deng Chao did something similar to what Benjamin’s doing here in Zhang Yimou’s Shadow. He worked out to film for one role, then immediately had to starve himself for the second role in the same movie. The movie was fantastic and he received lots of praise for his performance. I’ve just recently published a blog on The Most Common Reason Why People Dont Lose Weight including a new detox tea solution! check it out and let me know what you think any feed back or comments are very much appreciated. Wow. Sounds like a Best Actor role if he does well. I have my reservations because his acting hasn’t interested me before, but this could be a breakthrough. That is a lot to sacrifice – both physically and mentally.